Preterm birth (delivery at less than 37 weeks of gestation) is the leading cause of infant mortality worldwide. So far, the application of animal models to understand human birth timing has not substantially revealed mechanisms that could be used to prevent prematurity. However, with amassing data implicating an important role for genetics in the timing of the onset of human labor, the use of modern genomic approaches, such as genome-wide association studies, rare variant analyses using whole-exome or genome sequencing, and family-based designs, holds enormous potential. Although some progress has been made in the search for causative genes and variants associated with preterm birth, the major genetic determinants remain to be identified. Here, we review insights from and limitations of animal models for understanding the physiology of parturition, recent human genetic and genomic studies to identify genes involved in preterm birth, and emerging areas that are likely to be informative in future investigations. Further advances in understanding fundamental mechanisms, and the development of preventative measures, will depend upon the acquisition of greater numbers of carefully phenotyped pregnancies, large-scale informatics approaches combining genomic information with information on environmental exposures, and new conceptual models for studying the interaction between the maternal and fetal genomes to personalize therapies for mothers and infants. Information emerging from these advances will help us to identify new biomarkers for earlier detection of preterm labor, develop more effective therapeutic agents, and/or promote prophylactic measures even before conception. Significant advances in elucidating disease pathogenesis and developing personalized therapies in oncology, pharmacology, cardiovascular biology, diabetes and other adult disorders have been facilitated by genomic medicine. However, so far, there has been relatively little application of genomic medicine to pregnancy and early childhood health. Through the use of genetic and genomic analytic techniques, the pathogenesis of human preterm birth - defined as delivery before 37 weeks of completed gestation - may be elucidated, paving the way for the identification of women at high risk of preterm delivery and for the development of personalized therapies. The biology of human birth is a complex, poorly understood process, the disruption of which confers an increased potential for the development of severe health problems in both infants and mothers. This disruption leads to anomalous parturition, which encompasses several potentially adverse pregnancy outcomes, including preeclampsia, fetal growth restriction, infections and, commonly, spontaneous preterm birth. The rate of preterm birth in the United States, after having increased by 20% to 12.8% of all births between 1990 and 2006 , has declined for the fifth consecutive year since its 2006 peak, and is now 11.7% . Late preterm infants - those born between 34 0/7 weeks (that is, exactly 34 weeks) and 36 6/7 weeks (or one day short of 37 weeks) of gestation - account for approximately 75% of all cases of preterm birth . It is in this late preterm population that preterm birth rates in the United States have been declining, which is largely attributable to changes in obstetrics practices for medically indicated preterm deliveries rather than enhanced understanding of the underlying mechanisms of preterm birth. The rate of preterm birth for pregnancies delivering before 34 weeks of gestation remained unchanged over the same time period. Progesterone supplementation to specific subgroups of high-risk women may be effective in delaying birth, although this intervention has relatively little impact on overall prematurity rates . Nonetheless, the reduction in late preterm birth is a significant advance in infant health. Although the frequencies of respiratory distress syndrome, sepsis and apnea of prematurity are lower in preterm infants born at 36 weeks than those born at 34 weeks , infants categorized as late preterm are more likely than their term counterparts to experience difficulties with feeding, jaundice and respiratory distress  (Table 1). In addition to being particularly prone to infection as well as to metabolic and respiratory complications, late preterm infants are six times more likely to die within their first week of life and three times more likely to die within their first year of life compared with infants born at term . Initiation of parturition before 37 weeks of gestation, most often occurring for an unidentifiable reason , may manifest as spontaneous labor or preterm premature rupture of membranes [7, 8]. Controversy exists as to whether these two phenotypes reflect the same underlying pathology or distinct mechanisms. Although the pathogenesis of preterm labor is not well understood, a plethora of maternal risk factors associated with a higher incidence of preterm birth have been identified, including classification as black or African-American, maternal stress, maternal age, tobacco use and surgical intervention for cervical disease [7, 9, 10] (Table 2). One important maternal risk factor for preterm labor may be grounded in genetics (Table 2). The risk of a woman giving birth preterm is almost doubled if her sister has given birth to a preterm infant . Mothers who were themselves born preterm are more likely to deliver preterm . The maternal risk of delivering an infant preterm is four times higher if one of her previous children was delivered preterm . However, the risk for a woman delivering preterm is unaffected by the history of preterm children of her partner with other women or by members of her partner's family . To begin to pare apart the pathogenesis of preterm labor, the use of mouse, rat, guinea pig, sheep and non-human primate models has been useful. However, each model organism has certain disadvantages that make it difficult to portray and study human preterm labor accurately [14, 15]. Because of the disadvantages of drawing comparisons between the pathophysiology of preterm birth in animal models and humans, coupled with the strong genetic foundation of preterm labor, it may be most effective to use human genetics and genomics to elucidate the mechanisms underlying preterm birth. Understanding the determinants of a healthy pregnancy is necessary for transformative advances in women's and infants' health. A healthy pregnancy requires both conserved structural and, more uniquely, temporal components. The temporal components - the programming that determines birth timing - will serve as the focus of this review. We will describe mechanistic findings that have emerged from animal studies, their limitations as applied to human parturition, evidence for genetic contributors to the risk for preterm birth in humans, and available results from human genetic and genomic investigations. We conclude with potential areas that could prove fruitful in further elucidating the genomics of preterm birth in the future. The use of animal models to study the events leading up to and throughout birth has provided significant insight into the mechanisms regulating parturition, at term and preterm. However, the applicability of current animal models of parturition to the physiological mechanisms of human pregnancy and birth has been limited, as the means by which these different species regulate and initiate parturition differ from each other and from humans. Perhaps the longest established animal model for birth timing is in sheep. The study of parturition in sheep is particularly relevant to human birth in that the gestation length and number of offspring per gestation is closer to that of humans than most of the common models in use, the sheer size of pregnant ewes and their fetuses make experimental manipulation easy, and a shift in the site of progesterone production from the corpus luteum of the ovary to the placenta occurs during pregnancy in both women and ewes . However, in contrast to the human simplex uterus, sheep have a bicornuate uterus, allowing them to maintain one or two fetuses per gestation, and a cotyledonary placenta as opposed to a discoid placenta, as found in primates, indicating that the mechanisms controlling parturition in sheep may be different from those in humans. Previous studies in ewes have also shown that parturition events depend on fetal regulation through the hypothalamic-pituitary-adrenal axis that ultimately result in a decrease in circulating maternal progesterone levels, that is, overt progesterone withdrawal , which does not occur in human parturition, limiting the usefulness of sheep for modeling the events of human parturition and preterm birth (Table 3). The use of mice has proven useful to further our understanding of the events leading up to parturition owing to the ease with which the mouse genome can be manipulated. Genes with the potential to influence parturition have been targets for the generation of knockout models. Several components of the cascade of events that occur during birth are conserved in both mice and humans (Figure 1), including prostaglandins, which serve as uterine contractile agonists, and contraction-associated proteins (CAPs), which activate the myometrium and facilitate its response to stimulants . Mice deficient in enzymes necessary for the synthesis of prostaglandins - cytoplasmic phospholipase A2 (cPLA2) and cyclooxygenase 1 (COX1), for example - have shown delayed labor, which can be reversed by treatment with a progesterone receptor antagonist or by administration of exogenous prostaglandin F2α (PGF2α), which stimulates luteolysis (degeneration of corpus luteum function for progesterone synthesis) [18–21]. The significance of prostaglandins as uterine contractile agonists has been shown in studies of mice with reduced 15-hydroxyprostaglandin dehydrogenase (15-HPGD) - an enzyme responsible for the metabolism of PGF2α as well as prostaglandin E2 (PGE2) - the expression of which has been shown to decrease in the chorionic trophoblast of women in labor [22–25]. These mice deliver a day early without luteolysis, as demonstrated by a lack of progesterone-withdrawal-induced labor . At term, the expression of CAPs such as the oxytocin receptor (OXTR) and connexin 43 (CX43) in humans and mice increases in the myometrium . Although the loss of oxytocin and OXTR in mice does not alter parturition [28–30], the concomitant loss of oxytocin and COX1 in mice leads to prolonged parturition that starts at normal term. This suggests that oxytocin maintains a luteotrophic role opposing the luteolytic role of COX1, which affects the presence of the contractile agonist PGF2α, allowing for normal progesterone withdrawal in these mice . The loss of CX43 (responsible for coordinating contractions in myometrial cells during labor) in smooth muscle tissues leads to slightly delayed parturition, even though these mice experienced normal upregulation of OXTR and progesterone withdrawal . Despite the similarities, the physiology of pregnancy and birth differ significantly between mice and humans. Mice have a bicornuate uterus and tend to have large litters (typically ranging from six to eight pups), and thus the mechanism(s) of uterine activation are likely to differ from that of humans. The primary source of steroid hormone production in mice is the corpora lutea of the ovaries throughout pregnancy, whereas humans undergo a luteal-placental shift of steroid production during pregnancy. Additionally, before parturition mice undergo progesterone withdrawal, limiting the relevance of pregnancy and parturition studies of this model organism to humans (Table 3). Comparison of mouse and human parturition. 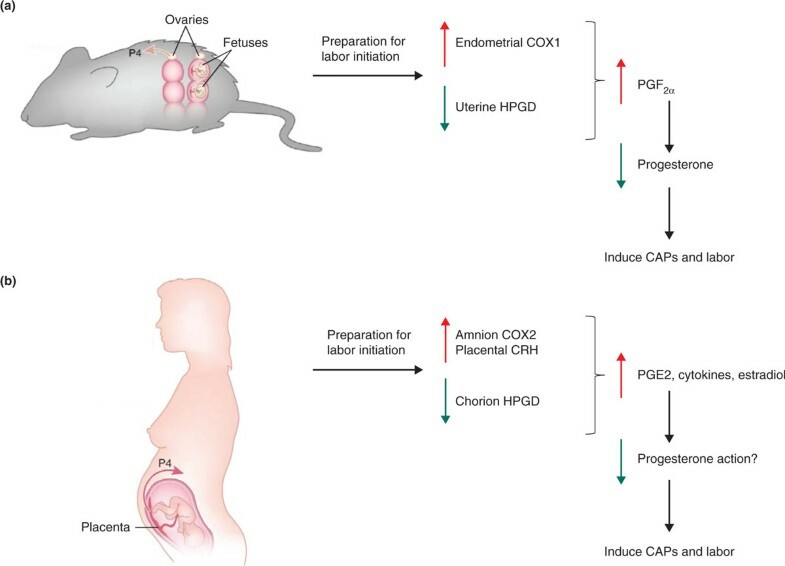 (a) In mice, initial mechanisms for labor initiation include induction of uterine endometrial cyclooxygenase 1 (COX1) expression and reduction of uterine 15-hydroxyprostaglandin dehydrogenase (HPGD) expression. These changes in prostaglandin metabolism lead to elevated prostaglandin F2α (PGF2α), which acts on the ovarian corpus luteum to decrease circulating progesterone (P4). This systemic progesterone withdrawal results in induction of contraction-associated proteins (CAPs) and transition of the uterine myometrium from a quiescent to an actively contractile state. (b) In human pregnancy, labor initiation is associated with induction of amnion COX2 and placental corticotropin-releasing hormone (CRH) and a reduction in chorion HPGD. These changes in prostaglandin metabolism and peptide signaling are associated with increased amnion prostaglandin E2 (PGE2), pro-inflammatory cytokines and estradiol. This pro-inflammatory milieu is hypothesized to cause 'functional' progesterone withdrawal (circulating progesterone does not fall), or progesterone resistance, followed by induction of CAPs and labor. Note that several fundamental differences between human and mouse parturition exist beyond the differences in systemic progesterone regulation at term. Murine gestation is multi-fetal, whereas human gestation is predominantly single fetus. In mice, the sites of prostaglandin and progesterone synthesis are maternal, whereas in human pregnancy, the primary sites of prostaglandin and progesterone synthesis in late gestation are from fetal tissues. Adapted from , Ratajczak CK, Fay JC, Muglia LJ: Preventing preterm birth: the past limitations and new potential of animal models. Dis Model Mech 2010, 3: 407-14 with permission from The Company of Biologists. Perhaps not as commonly used in research as the mouse and rat, the study of parturition in guinea pigs has revealed this process to be more similar to that of humans than in mice or rats. Through the duration of gestation up until parturition, guinea pigs maintain high levels of maternal serum progesterone and, consequently, do not require progesterone withdrawal to initiate labor, similar to human labor. Also like humans, guinea pigs have a hemomonochorial type of placentation, and the placenta, after the first four weeks of gestation, is the predominant source of progesterone . Although a 7X coverage genome sequence has recently become available, the use of guinea pigs to model human parturition and preterm birth is limited owing to a relatively long gestation length (67 days) relative to other rodent models, thus increasing the length of time required to perform experiments, as well as limited protein and cDNA reagents, and suboptimal molecular genetic techniques for use on this model system (Table 3). Non-human primates present a more analogous model organism for the study of parturition and preterm birth as their reproductive biology is most similar to that of humans. Rhesus macaques, like humans, do not undergo maternal serum progesterone withdrawal at term. Great apes and humans experience a continual rise in progesterone concentration throughout the pregnancy, peaking at term, in comparison to Old World monkeys, which have basally low, unchanging levels of progesterone, and New World monkeys, which undergo progesterone withdrawal . Although non-human primates are physiologically representative model organisms to understand human parturition and preterm birth, the expense and time necessary to maintain and study these animals as well as their long gestation periods (greater than 5 months), the unfeasibility of genetic manipulation, and the lack or limitation of optimized reagents make their use less practical (Table 3). Although the currently employed model organisms for parturition and preterm birth have their benefits, perhaps the best model for human parturition and preterm birth is humans themselves. Analyses of sequences across human, chimpanzee and mouse genomes indicate that one of the most divergent functional categories includes the genes involved in reproduction . The use of computational biology coupled with the rapidly expanding availability of mammalian genomes opens the possibility of isolating rapidly diverging genes or conserved noncoding sequences that may be relevant to human parturition, and identifying interesting variants in genome-wide association studies, which would provide potential targets that may determine birth outcome . Preterm birth is etiologically complex, with contributions from the environment and genetics, which could involve both maternal and fetal genomes . The analysis of birth timing concordance in the offspring of twins demonstrated that both maternal and fetal genetic effects contributed to defining the variance in gestational age (Table 4) . By studying correlations between genetic relatedness and trait concordance, genetic effects are calculated to account for 25 to 40% of variation in fetal growth rate and gestation duration; additionally, birth weight, small size for gestational age, and preterm birth had significant genetic contributions . Comparisons between full siblings and half siblings facilitate studies of variable relatedness within a shared environment, allowing for the study of genetic contribution as well as differences between maternal genetic contribution (calculated at 14%) and fetal genetic contribution (calculated at 11%) . -, No evidence for genetic contribution; +, moderate genetic contribution; ++, strong genetic contribution. Preterm birth is a trait that appears to be transmitted primarily in a matrilineal manner across generations; the risk of a woman having a preterm delivery is increased if her mother, full sisters or maternal half-sisters have had preterm deliveries, but is unaffected by the occurrence of preterm deliveries in her paternal half-sisters or in members of her partner's family . Birth before 37 weeks of gestation increases a woman's own risk of preterm delivery by almost 20% , and having a previous preterm delivery confers an increased risk of recurrent preterm delivery . Although the paternal contribution to birth timing in the context of fetal genetic influences has been somewhat controversial, data suggest a smaller role for paternal compared with maternal fetal genes in birth timing [36, 37]. On the basis of this evidence of a genetic component in the timing of birth, genetic studies have investigated both maternal and fetal genomes, as both genotypes can affect perinatal outcomes . Thus far, most human genetics studies with respect to birth timing have focused on comparing polymorphism frequencies in case-control studies, with preterm versus term birth as the dichotomous trait outcome . To elucidate further the role of genetics in birth timing, candidate genes have been analyzed in a multitude of pathways that are thought to be involved in parturition. Several recent comprehensive reviews of candidate gene association studies have been published [39–41]. Below, we provide representative examples of a subset of these studies, followed by discussion of genome-wide approaches. Perhaps the most commonly studied pathways for potential candidate genes are those involved in immunity and inflammation, as inflammatory factors have been suggested to play a role early in the transition from quiescence to active labor in term as well as preterm birth . The induction of pro-inflammatory mediators has been implicated in the onset of parturition, particularly tumor necrosis factor (TNF)-α and its receptors (TNFR1 and TNFR2). Although some studies have detected polymorphisms in these genes that alter the risk for preterm birth in either the mother or fetus, the results have generally failed to be replicated  or have not been generalized across populations [43, 44]. Analysis of pro-inflammatory and anti-inflammatory interleukins and their receptors have generally revealed no consistent association with preterm birth, with mixed results for interleukin (IL)-4, -6 and -10 as well as for interleukin receptors 1 (IL1R) and 6 (IL6R) . Examination of other cytokines and pathogen recognition genes has similarly not provided compelling evidence for association with preterm birth. Another critical process for the initiation of parturition involves the transition of the uterus from a quiescent tissue, influenced by mediators that inhibit contraction, to a synchronously contracting tissue. Searching for candidate genes involved in premature uterine contraction has revealed the potential association of two polymorphisms in the gene encoding the β2-adrenergic receptor (ADRB2), which is responsible for modulating uterine muscle contractions through the promotion of smooth muscle relaxation in the uterus, with preterm birth risk [45–47]. Analysis of another molecule involved in uterine contraction, the dopamine receptor D2 (DRD2), did not reveal an association with preterm birth . Furthermore, no links with preterm birth were established between the prostaglandin pathway genes prostaglandin E receptor 2 (PTGER2), prostaglandin E synthase (PTGES) or prostaglandin F receptor (PTGFR), despite the activity of prostaglandins in promoting uterine contractility . As maintenance of pregnancy requires proper functioning of the placenta, genes involved in angiogenesis and thrombosis have also been targets for association with preterm birth and placental dysfunction. One small study described a potential association between preterm birth risk and an intronic polymorphism in the vascular endothelial growth factor (VEGF) gene, which is responsible for inducing angiogenesis , but this has not been replicated in larger cohorts. Studies of hemostasis genes have yielded mixed results: an identified association  for the gene encoding one factor (factor V, F5) was not replicated [45, 49]; some studies identified genes encoding factors associated in infants only (factor XIII, F13A1; thrombomodulin, THBD) [45, 50], or in both mothers and infants (factor VII, F7); and others were not associated with preterm birth at all (factor II, F2; protein C receptor, endothelial, PROCR; protein C, PROC; and tissue factor pathway inhibitor, TFPI) [45, 50]. Although some advances have been made in studies of the genetic contributions to preterm birth using candidate gene approaches, concrete causal links between these polymorphisms and preterm birth have not been established. Recent meta-analyses have been performed and summarized, providing a useful resource for investigators interested in the genetics of preterm birth [51, 52]. However, through the use of genome-wide tools and analysis techniques, previously unanticipated mechanisms may be revealed. To elucidate new genes and pathways involved in normal and pathological parturition, non-biased, genome-wide approaches offer substantial promise. Below, we describe complementary approaches to identify both common and rare variants that increase risk for preterm birth, and their associated findings. Genome-wide association studies (GWASs) are an unbiased method for the discovery of new functional mechanistic pathways in disease processes  such as preterm birth and abnormal fetal growth. Through meta-analysis of six GWASs, variants in adenylyl cyclase type 5 (ADCY5), which has pleiotropic effects on glucose regulation, and variants near cyclin L1 (CCNL1), which may be involved in pre-mRNA splicing and RNA processing, have been shown to be associated with fetal growth and birth weight . Furthermore, by looking genome wide at single nucleotide polymorphisms (SNPs) in a prioritized list that arose from a comparative analysis of genes showing divergence between humans and other mammals, a novel association between the follicle stimulating hormone receptor gene (FSHR) and preterm birth was revealed . GWAS data for approximately 1,000 preterm birth cases and 1,000 controls is currently available from the Danish National Birth Cohort through the database of Genotypes and Phenotypes (dbGaP) for analysis . However, in this dataset, gene variants with genome-wide statistical significance have not been found. Recent pathway-based, rather than gene-based, analyses using a custom database of genes curated from existing literature for preterm birth (dbPTB), have implicated several potentially relevant pathways that can be used to elucidate further gene-gene and gene-environment interactions [52, 57]. Further meta-analysis with emerging new data from other groups should provide additional power for the detection of associations. Modest sample sizes, along with the inability to rigorously sub-phenotype preterm births into more homogeneous groups based on gestational age or potential etiology, has limited the impact of GWASs so far. One underexplored avenue for determining maternal risk for preterm birth involves the influence of the mitochondrial genome. The high mutation rate of mitochondrial DNA (mtDNA), together with the fact that most of its encoded proteins are evolutionarily conserved, allowing for the selection of neutral or beneficial variants, has generated interest in defining human mtDNA variations and their roles in human biology . The results of two mitochondrial genome scans from two European populations examining links between mitochondrial genotypes and preterm birth did not reveal any associations with preterm delivery and its related outcomes . Perhaps one of the most significant limitations of the study was the lack of data regarding predefined haplogroups. As the transmission of mtDNA is uniparental due to the lack of recombination, pathogenic, functional and neutral variants can interact and are often linked with one another . Thus, a multitude of SNPs can accumulate along branches of a haplogroup, which may alter the significance of other sub-haplogroups; hence, the test for individual SNPs reveals an inadequate image of the evolutionary and functional role for mtDNA in an individual's haplotype . As the variants detected by GWASs have typically explained only a minor proportion of the heritability of complex diseases, it may prove more informative to pursue the identification and association of rare variants with disease . Although not as many examples as for common SNPs have been reported, rare variants have been shown to play a role in complex traits . So far, the analysis of rare variants associated with preterm birth has been limited. In one study exploiting candidate gene linkage for 33 genes in 257 families, nonparametric and parametric analyses performed on 99 SNPs in premature infants and mothers of premature infants resulted in the identification of a moderate association with preterm birth of corticotropin releasing hormone receptor 1 (CRHR1) and cytochrome P450 2E1 (CYP2E1) in affected infants, and with ectonucleotide pyrophosphatase/phosphodiesterase 1 (ENPP1), insulin-like growth factor binding protein 3 (IGFBP3) , TNF receptor-associated factor 2 (TRAF2) and 7-dehydrocholesterol reductase (DHCR7) in mothers . DNA sequence analysis was performed for CRHR1 and TRAF2 to detect novel potentially causative mutations, but no new variants were detected . 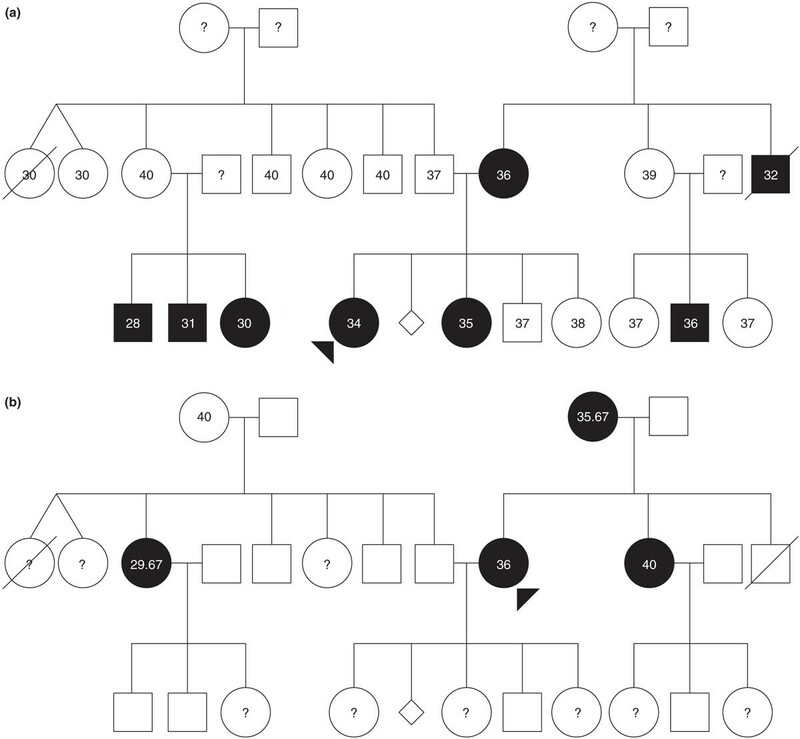 The use of family-based designs increases the power to detect associations, controls for heterogeneity/population stratification, and might elucidate the effects of allele origin as well as transmission of phenotypes of disease modulation, allowing for the study of parent-of-origin effects . Family-based linkage analysis, combined with case-control association studies, have been used to determine a susceptibility haplotype for preterm birth in Finnish multiplex (multiple individuals affected in different generations) and nuclear families . Through the use of parametric linkage analysis, genetic factors that influence preterm birth in either the fetus or mother may be elucidated by accounting for both potential mechanisms of action of the preterm birth phenotype: being born preterm (an affected fetus or an infant phenotype); or giving birth preterm (an affected mother phenotype) (Figure 2) . This method, followed by a case-control study and haplotype segregation analysis, identified a novel susceptibility gene (IGF1R) that, through the fetal genome, results in a predisposition to preterm birth . Additionally, two X-linked genes were implicated when preterm birth was the studied phenotype: the androgen receptor (AR) and IL-2 receptor γ subunit (IL2RG) genes, which are located near a significant linkage signal locus (Xq13.1) . Further analysis revealed long CAG repeats in the AR gene that were overrepresented, as well as short repeats that were underrepresented, in preterm individuals in comparison to term individuals, implicating this as a potential fetal susceptibility gene for preterm birth . Two representations of affected status in the same pedigree with recurrent spontaneous preterm birth. Numbers indicate the gestational ages for each individual, in weeks. Circles indicate females and squares indicate males, diamonds indicate miscarriages. Preterm birth is indicated with closed (black) circles or squares, and question marks indicate unknown gestational ages. (a) Illustration of the pattern of affected status if the infant is proband for preterm birth. (b) Illustration of the pattern of affected status if the mother is proband for preterm birth. Modeling the incidence of maternal and infant phenotypes indicates that genetic influences on the timing of parturition are important and complex, and thus unlikely to be explained by a single gene model. Reproduced from  with permission from S Karger AG, Basel. We have summarized recent findings from model organisms that have defined components of birth timing mechanisms for those species, and the evidence for variable maternal and fetal contributions to the process depending upon the species investigated. We further provide evidence that genetic variation contributes to preterm birth risk in humans and, as a corollary, that genomic approaches should prove fruitful for revealing key components of the molecular machinery controlling the duration of human gestation. Although currently employed genomic approaches have been useful in starting to unravel the complexity of birth timing, much remains to be learned by applying more thorough genome sequencing methods. One such approach is whole-exome sequencing . Several efforts are currently underway in this regard. An initial report from our group analyzing exomes of ten mothers from families with recurrent instances of preterm birth, including two mother-daughter pairs, found that the complement/coagulation factor pathway was enriched in harboring rare variants . Whole-genome sequencing may provide the opportunity for the identification of regulatory elements as well as amino acid changes, although the scale of the necessary bioinformatic analysis remains formidable . Large-scale genome sequencing studies, such as the Inova collaboration, are currently being planned and initiated to investigate de novo mutations in infants and contributions of the maternal genome to preterm birth . The availability and synthesis of genomic data from preterm infants, controls and parents will significantly advance current understanding of the genomics of birth timing, paving the way for the determination of the mechanisms regulating the timing of parturition. What must not be overlooked in these future efforts is rigorous phenotyping and ascertainment of environmental exposures. Preterm birth is a very heterogeneous phenotype. Suitable numbers of individuals with more restricted phenotypes, including gestational age windows at birth, type of spontaneous delivery (spontaneous labor versus premature rupture of membranes), associated fetal growth characteristics or maternal characteristics, will greatly accelerate gene identification. To facilitate time-efficient collection of subject samples (mother, father and infant at a minimum; maternal grandparents and more extended family structure when likely to be informative) and phenotype data, more extended international collaborations with comprehensive, standardized definitions and data fields are essential . Ultimately, gene discovery in humans will require the innovative application of noninvasive methods during pregnancy, such as functional imaging, proteomics and metabolomics, as well as the generation and investigation of new preclinical model organisms and ex vivo systems, to establish mechanisms and define potential prophylactic interventions for preterm birth. We thank the March of Dimes for a Prematurity Research Initiative Grant (to LJM) for work described in this review.